Duration : 5 x 20 min. 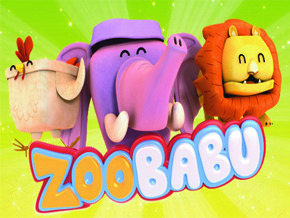 Zoobabu is a fun-filled, animated guessing game about animals, for levels Pre-K to Grade 2. In each episode, kids are given clues about a hidden animal inside a magic box. Step-by-step, and clue-by-clue, they discover the identity of the animal inside the box. A great way to introduce oral communication skills. Each DVD has a theme and is chaptered.